City of Angels is two shows in one. It is the interweaving of two plots, one dealing with the writing of a screenplay in the legendary Hollywood of the 1940′s; the other, the enactment of that screenplay. 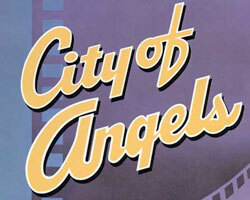 This double feature quality leads to many other unique production values, the most notable being the fact that City of Angels is perhaps the only “color coded” show any theatre audience is likely to see. The movie scenes appear in shades of black and white, and the real life scenes are in technicolor. The show boasts two musical scores. One provides the cast with numbers to help reveal certain emotions or to celebrate particular moments in the way that only music can. The “other” score was written to emulate pure movie soundtrack music, 1940′s vintage. It is entirely appropriate, then, that the final curtain comes down on two happy endings.